Are you a veteran or surviving spouse applying for the Aid and Attendance pension benefit? Here are answers to frequently asked questions about this little known benefit available to veterans and spouses. The Aid and Attendance (A&A) Pension provides benefits that reduce the cost of senior care for veterans and surviving spouses who require assisted living. Am I eligible for the Aid & Attendance pension? Any wartime veteran with 90 days of active duty, 1 day beginning or ending during a period of war, is eligible to apply for the Aid & Attendance Improved Pension. A surviving spouse (marriage must have ended due to death of veteran) of a wartime veteran may also apply. The individual applying must qualify both medically and financially. This free, one-minute questionnaire can better help determine if you may be eligible for the Aid and Attendance benefit. What is the difference between wartime and peacetime service? Military service is classified either as wartime or peacetime service. This distinction is important because there are significant advantages specifically accruing only to veterans with wartime service. For example, only veterans with wartime service are eligible for non-service-connected pension benefits like Aid and Attendance. How do I apply for Aid & Attendance? There are three main steps in the application process: gathering the necessary documents, filling out the correct application form to submit to the VA with the necessary documents, and mailing all of the documents to the correct pension processing center. Head on over to our How to Apply page to find out more. Is there any way to start the application process while I gather all the documents? You can submit a one-page VA Form 21-0966 (INTENT TO FILE A CLAIM FOR COMPENSATION AND/OR PENSION, OR SURVIVORS PENSION AND/OR DIC) which will get the claim into the system. How long does it take to process the application and get approved? This is a difficult question to answer. Much depends on the VA regional office for your area. On average, 6 to 8 months seems to be the normal approval time at the moment. Some approvals come through in as little as 6 weeks, but these are the exception. We know of people still waiting for an approval 12 months from the date of filing. Keep in mind that if the benefit is approved, it is applied retroactively to the date of application. Also, if the applicant is over 90 years old, include a letter requesting that the application be expedited. The VA is supposed to give priority to any application for benefits by a veteran age 90 or older. What are the Aid and Attendance pension benefit amounts for 2017? The current A&A benefit amounts can be found on our About page. Is there a "look back" period when submitting the application? Currently, there is no "look back" period, as with other government programs, such as Medicaid. The VA looks at the value of assets on hand at the time of Aid & Attendance application. Can I apply for the Aid & Attendance pension if I am already receiving compensation from the VA? If you are currently receiving disability compensation from the VA, you cannot receive both the compensation and pension. What you can do is file for the Improved Pension based on non-service connected health issues. If the application is approved, the VA will pay whichever benefit has the highest dollar amount. If you are receiving compensation for a service-connected injury, that compensation would not be counted as income. However, you should include VA Form 21-4138 Statement in Support of Claim that specifies that you receive compensation, but you want the VA to pick which benefit will pay the most. If you are receiving compensation you need to make certain that you are receiving the maximum possible dollar amount for your condition BEFORE filing for the Improved Pension. Note: health issues can be a secondary condition related to your service-connected disability. You should speak with a qualified Veterans Service Officer before filing for Improved Pension. If you are service-connected, you might also be eligible for Special Monthly Compensation (SMC). SMC is a rate paid in addition to or in place of 0% to 100% combined degree compensation. To qualify for SMC, a veteran must be disabled beyond a combined degree percentage or due to special circumstances. You would need to speak with a Veteran's Service Officer to assist you in determining if you are eligible. What documents do I need to include in the application? Discharge/separation Papers (DD-214. If you need to request military records, please visit www.vetrecs.archives.gov to get a copy. Copy of Marriage Certificate (for surviving spouse or when filing for both the veteran and spouse). Copy of current Social Security award letter (Letter that SS sends at the beginning of the year stating what your monthly amount will be for the following year). Net worth information, including bank accounts, CD's, trust, stocks, bonds, annuities, etc. Proof of insurance premiums, medications, medical bills or any other medical expenses that are not reimbursed by insurance or Medicare. Physician statement that includes current diagnosis, medical status, prognosis, name and address, ability to care for self, ability to travel unattended, etc. If the applicant is in a nursing home or assisted living facility, you will need to submit a Nursing Home Status Form and a Statement of Occupancy from the facility (ask the facility for this Statement). Banking information for direct deposit of monthly payments (include a voided check). Be sure to include VA form 21-0845 (Authorization to Disclose Personal Information to a Third Party) if you are filing for your loved one and need to oversee the application process. Without this authorization, the VA will not discuss the application with you. Never send originals and ALWAYS send all correspondence via Certified Mail "Registered Return Receipt" as well as keeping a complete copy of everything for your own records. If you are in the process of completing an A&A claim, the VA states, "It is not necessary to request a duplicate copy of a veteran's discharge or separation papers solely for the purpose of filing a claim for VA Benefits. If complete information about the veteran's service is furnished on the application, the VA will obtain verification of service." In spite of what the VA says, we recommend including a copy to avoid any imposed delay. Here are complete instructions on How to Apply for the Aid and Attendance Benefit. Are there other Veterans Improved Pensions that are available besides Aid & Attendance? The VA classifies any veteran at the age of 65 to be permanently and totally disabled regardless of your physical state. The classification of "disabled" entitles the veteran or widow for a Basic Pension if he/she meets the net worth and income criteria. The same is true for the surviving spouse. No Physician's Statement is required for filing for Basic Pension. Here is a worksheet to learn how to calculate "countable income". For those who wish to remain in either their own home or the home of a family member, you can apply for the Housebound level of the Improved Pension. A Physician's Statement is also required for the Housebound level. The VA will automatically consider this level if the claimant does not fully qualify for Aid and Attendance. The criteria for Housebound requires that the claimant needs regular assistance, but is not as limited as those who would qualify for Aid and Attendance. Care can be provided by family members or outside caregiver's agencies. Families need to be reimbursed for the care and services they are providing just as you would an outside agency. It is recommended that you survey the costs of these services in your area to determine what a fair amount to charge would be. It is imperative that an accurate accounting of expenses is kept. Do not ever pay in cash as you must have a record of payments via check, money order, etc. The VA does not currently send out an annual evaluation form known as an EVR to determine if the applicant still meets the standards of criteria, but this could be reinstated in the future. Without proof of expenses, the VA will stop payments on the pension. An EVR could be required an all three levels of the Improved Pension. How can I find my VA file number? If a veteran has never had a claim with the VA before they may not have a VA file number. In this case, for the Aid and Attendance application, you would leave that field blank on the forms. Is the Aid and Attendance pension benefit taxable? No, the Aid and Attendance pension is not a taxable benefit. Does the VA recognize Power of Attorney? Unfortunately the VA does not recognize Power of Attorney (POA) or Durable Power of Attorney (DPOA). If your loved is capable of managing their own affairs, and you hold POA of DPOA for emergency purposes, it will be easier for them to sign and handle the appropriate correspondence. Please be advised that (parent's name) and I have no issue with the VA finding of incompetence and wish to proceed with the appointment of a fiduciary. We wish to appoint myself (her/his insert your relationship to the veteran) as fiduciary. I understand that I must be interviewed prior to that appointment and would appreciate such an interview be scheduled as soon as possible. At this point both you (or whoever is asking to be appointed) and the applicant will have to be interviewed by a VA Field Agent who will determine if you are an appropriate person to assign fiduciary to. Note: Due to the overwhelming needs for interviews such as this, it can take months before you are contacted to schedule an appointment. You may need to be proactive in calling and "requesting" that an appointment be scheduled. You should allow at least 30 days before following up with contact. I respectfully question the withholding of my (parent's name) benefits, pending the appointment of a fiduciary. Referencing a VA policy: Pursuant to VA Manual M21-1, Section 17.15: Procedure Upon Receipt of Evidence of Incompetency, your manual states "Do not routinely suspend direct payments to a beneficiary pending development of an issue of incompetency or certification of a fiduciary." The manual further states: "If entitlement to benefits has been established but no payment has been made or if increased benefits are payable, make a determination as to whether or not benefits should be paid directly pending certification. The determination should consider if delaying the payment of the benefits would cause undue hardship for the beneficiary. If the evidence of record shows that delaying payment would create a hardship, properly annotate the award, referencing the evidence reviewed and the justification for paying benefits directly to the beneficiary." I think if you reference (parent's name) claim, you will see that withholding his/her payment does constitute a hardship for him/her. I would like to request that he/she receive payments during the fiduciary appointment process. What portion of assisted living expenses can be counted as deductible expenses? If the VA rules that the applicant is entitled to Aid & Attendance or Housebound benefits, then ALL costs are deductible. The VA's Operating Manual states: "Allow all reasonable fees paid to the facility as long as the facility provides some medical or nursing services for the disabled person. These services do not have to be furnished by a licensed health professional." If my parents sell their home before moving into assisted living, do they need to count that money as income? It does not count as "income", BUT the moment that money is deposited into the bank, it will automatically become part of their net worth. If plans are to sell the home, it would be best to handle this matter before making application for A&A. It may be advisable to speak with a financial advisor so that they can determine the best way to disperse the money from the sale. Any money that is retained in savings accounts, put into CD's, IRA's etc, will become part of their net worth. Remember that there is no "look back" period for Aid & Attendance. Assets are counted from the date of application. The VA's income-based programs are intended to give beneficiaries a minimum level of financial security. They are not intended to protect substantial assets or build up the beneficiary's estate for the benefit of their heirs. The purpose of this program is to help those in financial need. My parents divorced. Would my mother still be eligible for this pension based on my other father’s service? Generally the answer to this question is no. However, if the divorce was due to physical abuse or extreme mental cruelty, the VA has been known to consider these circumstances and consider the application. There would have to be documentation and unquestionable evidence supporting the claim of abuse in order for this to be applicable. Even if this is the case, the VA is not required to consider the application. My mother needs to be moved to an assisted living facility, but my father is still capable of living at home. Can we file for her based on my father’s service? The veteran has to qualify in order for the spouse to be eligible, so no, you cannot file based on her need. However, a vet with an ill spouse can file for "Basic" Pension if all of her medical costs wipe out their monthly income. The application process is the same as if the veteran were filing for Aid & Attendance. My father died and my mother remarried a non-veteran who has died. Is she eligible to apply based on my father’s service? Unless she was already receiving death benefits after your father died, she would not be eligible to make an application based on his service. My loved one died before payments were made on an approved application; is anyone entitled to the accrued funds? If your loved one passes during the application process prior to funds being released, you are entitled to file against those accrued benefits for expenses associated with the "last illness." This is not limited to just the out of pocket expenses incurred for final arrangements not covered by pre-existing arrangements or policies, nor is it for the last ambulance ride. You made application on March 15, 2008 for Aid & Attendance. The application was approved, but the VA delayed payments due to incompetency issues such as dementia pending a fiduciary being approved or appointed. Your loved one passes on August 25, 2008 leaving 5 months of accrued benefits that were never paid out. Most would assume, based on the form letter you will receive from the VA informing you that the file has been closed since the applicant is now deceased, that there is no other recourse, when actually there is. We suggest that in addition to closely following the directions for completing Form 21-601 that you include a copy of your birth certificate indicating you are a legal heir. You will also need to list all siblings who may also be entitled to file. In the case of a sibling or other legal heir who has been excluded from entitlement, you need to include a copy of the Last Will & Testament validating that fact. You only have 1 year to file for reimbursement. You should anticipate 6-12 months for the claim to be processed and check(s) issued. An application has to already be on file with the VA that has been approved. How do I determine "countable income"? The formula for "countable income" is not very difficult. However, you should be able to document how you arrived at your figures. This worksheet is not required to be submitted with the full application. 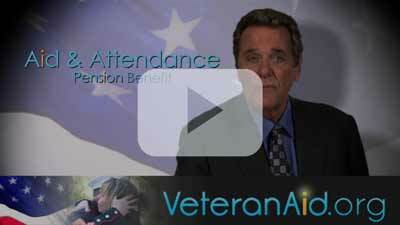 Can you receive both Medicaid and the veterans Aid and Attendance benefit? A veteran and/or spouse of a veteran can receive both Medicaid and the veterans pension benefit; however, the maximum Aid and Attendance benefit amount they will be able to receive is $90 a month. This $90 must be spent on personal care items. We have attempted to distill the information down to what’s most important to make it easier for you but if you prefer to do more research on your own, please ready one of these most updated handbooks on Federal Benefits for Veterans, Dependents, and Surviving Spouses.